America! Tomorrow’s your birthday. We’re not even in the office today, because we’re out celebrating. Robots posted this for us. American robots. You know what other American machines are awesome? Muscle cars. With raging, freedomcharged V8s and liberty injection. Cars like the Chevy Camaro, the Dodge Challenger and Charger, and the Ford Mustang. But we’re not going to talk about the Mustang today. Are you offended? Cut it out, because we wrote a whole month of posts about the mighty Mustang not too long ago. We’re taking a look at the Camaro and Dodge twins to find out one thing: muscle car parts that get more power. Power that vaporizes rear tires. Power that makes cowboys weep. Power that strips the cowardly paint off your neighbor’s commie Lada. Chevy just announced a new Camaro for 2016, with a little turbo version and everything. But you don’t have that one yet. What you do have is a 10-15 SS, and it has a 6.3 LS2 V8, complete with 420 lb-ft of torque and 426 horsepower, 8.52 feral stallions for each of these 50 United States. That’s okay, but we’re not okay with okay. We can make it more awesome, so we’re going to slather it with Corsa parts and leave it in the smoker for 16 hours. When your Camaro was designed, the boffins at GM made the stock intake to let in alot of air, but also to minimize production cost and interior noise. Because it had to be quiet and cheap to build, it couldn’t let in as much air, and that meant the LS3 couldn’t produce as much power. Bricks without straw and all that. But you don’t care about the noise. In fact, the noise is awesome. It’s the Nirvana of engine compartment rock bands. (The engine itself is the Journey, and the supercharger is the AC/DC, just for reference.) You’d rather hear the intake. So you can get that power. 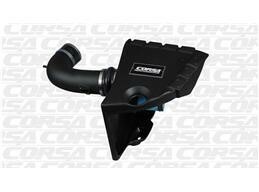 Corsa’s PowerCore closed box cold air intake can give it to you. How much power? Even by itself, the intake adds 18 horsepower and 23 lb-ft of torque. How huge is that? Bigger than Mt. Rushmore’s baby. Manufacturers scrounge for years after 18 extra horsepower. Corsa accomplishes all this with their high-flow, wide diameter tube, their PowerCore filter (which only needs to be changed every 150,000 miles), and their closed-box designed. This box isolates the cold air coming into your car and heading through your intake, from the hot air swirling around in the engine bay. Cold air is denser than hot air. There’s more oxygen per handful of cold air. More oxygen heading into your engine will create a more potent combustion within the cylinders, and this means more power. What about breathing out? In the same way that intake noise was muffled and hampered performance, exhaust noise is muffled and hampers performance. The stock exhaust sounds okay, (not that we’re okay with okay) but it’s restrictive. All the bald eagles flying out of your engine and through the exhaust have to make a bunch of turns and bottleneck through small outlets on their way. This makes sure your exhaust note stays pleasant, but tame, like a post-feeding zoo animal. We say let it sing, with this Corsa Sport cat-back exhaust. A big part of the factory exhaust design is getting rid of drone, an effect of resonant frequencies inside the cabin. It sounds terrible and gets annoying really fast. Cheap, no-name exhaust systems often come with an extra helping of drone. The factory’s solution is to simply muffle the stuffing out of it until you can’t hear that glorious exhaust sing anymore, and the car is down on power. Corsa’s solution is RSC, Reflective Sound Cancellation. They pioneered this system back in the late ’90s and it still works brilliantly. RSC captures drone-causing frequencies and pits them against each other right in the housing of the muffler. This cancels them out, eliminating the drone. This also means they don’t have to rely on convoluted, overstuffed mufflers and exhausts and can focus on improving flow. Flow is key in muffler design. Just like breathing out through a straw (even one from McDonald’s) forces your lungs to work harder, pushing exhaust gasses out of your stock exhaust system forces it to work harder. Horsepower that could have gone to spinning your wheels faster goes to breathing. We can’t have that. Not while the Constitution stands. 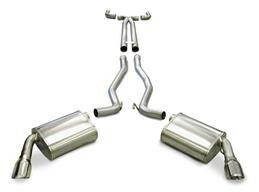 Corsa’s design incorporates smooth, mandrel bends and low-resistance mufflers. This all adds up to 6 hp and 7 lb-ft of torque. That may not sound like much, but combined with your intake, it’s a big deal. As an added bonus, the Corsa Sport is almost 20 lbs lighter than the stock system. Don’t worry, Mopar soldiers. We’re not leaving you out. So your Challenger or Charger aren’t Hellcats? Cry about it. You’ll never use that 707 hp, anyway. Instead, you could beef up your 5.7 Hemi R/T. Stock, you have a very healthy 375 hp and 410 lb-ft of torque in the Challenger, and 368 hp and 395 lb-ft in the Charger (Coolest family car ever?). We can make them even better with a few simple mods, just like Robert Livingston made America better with the simple mod of the Louisiana Purchase. And just like he got a killer deal, these will be much more affordable than a Hellcat. Let’s start with that intake on the Challenger. 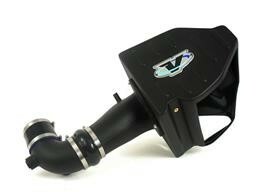 This Volant Cool Air intake is designed specifically for your Challenger R/T and works just like the Corsa one works on that Camaro up there. It even uses the same PowerCore filter type, so it’s good for 150,000 miles. And it’s blue, like one of your favorite corners of the flag. You can install it yourself, and it’s designed to get you the coldest air available. Volant doesn’t advertise what kind of horsepower or torque gains you’ll get from the intake, but you can be sure that extra airflow will come into play later. Since the Charger and Challenger are slightly different in shape, the intakes are also slightly different. 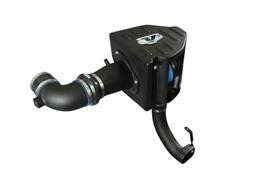 You’ll find the Volant cold air intake for the Charger here. Don’t get them mixed up, either, because even though both cars use the same engine, the exhaust bends are slightly different. Here’s the one for the Charger, and here’s the one for the Challenger. 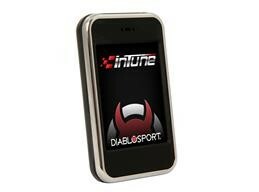 Here’s a part that works for either, and provides even more power: The DiabloSport inTune. It looks like a miniature iPhone, it plugs in under your dash, and it gets you an extra 15 hp and 20 lb-ft. How? Excellent question. Sit back down. Your Hemi’s fuel use is controlled by the car’s ECU, the computer. It comes preprogrammed with a set of fuel maps, parameters that let the computer know how much fuel to use based on a number of factors: how far the pedal is depressed, the density of the air, and so on. Now, to make more power, you need more air and exhaust flow, like we discussed above, but you also need more fuel. From the factory, Chrysler can’t give you more fuel, because they have to satisfy the people who are so afraid of horsepower they think no one should have any. But in the aftermarket, spray away. The InTune lets you reset the fuel maps for performance, including tunes for 91 and 93 Octane. More power. Then, if you’re getting ready to go on the highway for a long trip across this great nation, you can reset the maps to the factory settings so you can get better MPG. There are a ton of other features on the inTune, as well. Does your check engine light ever come on? Now you can find out why. You can log data, like 0-60 times, for up to 30 minutes. It includes a USB cable so you can plug it into your computer and automatically download new tunes and updates. Change all kinds of stock parameters: idle RPM, speed limiters, rev limiters, shift firmness, torque management, fuel management, and more. You can even disable the annoying skip-shift stuff. This is the land of freedom. Your car should reflect that. And until Skynet takes over and we have to blow up the robot factories, we tell the computers what to do. Not the other way around. Best of all, the inTune is most effective when supported by an aftermarket exhaust, like the American Thunder, and a cold air intake, like the Volant. You’re welcome. All right, America. Stop reading the internet. Get in your muscle car and hoon it. Smoke some tires and smoke some meat. Blow up some fireworks, eat too much, and wave some stars and stripes. Happy birthday.